My issue every semester was finding the cash to purchase the ridiculously overpriced textbooks, edition 1 for the first half of class, edition 2 for the latter, and the $100 flash cards all written by (surprise surprise) my professor. 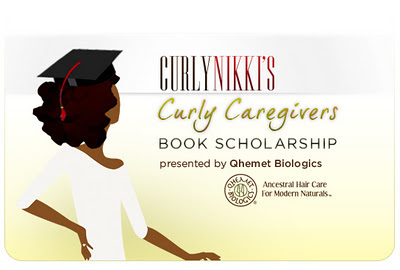 So to save you at least that headache, my friends at Qhemet Biologics and I present... CurlyNikki’s Curly Caregivers Book Scholarship! In fact, this is our SIXTH award season! Two, five hundred dollar ($500) scholarships will be awarded to students enrolled full-time in any year of their college career (accredited 4-year undergraduate or graduate program) in a field related to psychology and mental health. One, five hundred dollar ($500) scholarship will be awarded to a student accepted or enrolled as a full-time undergraduate student at an approved, 4 year, accredited institution in ANY major field. To be eligible, you must be a U.S. citizen or eligible non-citizen, be currently enrolled in a degree seeking program and have a minimum cumulative GPA of 3.0. Winners will be asked to verify all of the above. Men are invited to apply as well! The application process is open from today, December 19, 2014 through January 2, 2015 at 5pm EST. A team of reviewers will then select the three winners and after a short verification process, will issue credit to each recipient for their book purchase for the Spring Semester. The three winning submissions will be announced and featured on CurlyNikki.com! Be creative, genuine… go HAM! Enter me too please! Thank you! Marlie D. Please enter me. What a great way to give back. I wouldve jumped on that $500 when I was in school. Please eneter me tin the contest. Keisha B. Thanks Keisha! Share it with the college students in your life please! for the record, I was gifted a jar of the Aethiopika Butter about a year ago. It was too heavy for my dry two strand twist-outs but I've found that it's great for sealing moisture into my wet/damp ends as well as keeping my dry ends pliable throughout the week. I also use it on Boog's fro from time to time. It's Olive Oil based and reminds me of Jane Carter's Nourish and Shine but a little thicker and more substantial. I'd love to hear other reviews if you've got 'em! That's a great thing to do. Please enter me in the giveaway. Davina W.
Great way to give back to the community and encourage our young adults to keep pursuing their educational goals!! leaving a comment for the giveaway and passing on scholarship info to my daughters. lol i just graduated from undergrad last last month and my major is psychology. i will be going to medical school though, so if theres a scholarship for that, that would be cool. but that aside, i think its truly admirable that you give back in such a big way Nikki (or should i say Alicia now lol) it makes me like this site even more. I feel lucky today! Nakia E.
This is a great thing. Books are only increasing in price unfortunately. Carmen J.
I've been wanting to try Qhemet for some time now. Fenaye M.
As a new natural I love trying new products! Thanks for the giveaway, Nikki! Please enter me: Erika A.
Qhemet Biologics sounds like a brand my coils would love....Vearneas F.
I love the scholarship idea. Next year when I am enrolled in the MSW program, I will make sure I apply. I'm not in school yet, but for future reference do you consider an "alternative therapy" a psychology field. Ie Music and art therapys. Just wondering because I was disqualified for a couple scholarships because they didn't consider those psychological smh. Netta T.
I'm a huge fan of music and art therapies. I'm assuming to specialize in these you have to be in a general psych program initially though, right? yay! which program are you looking at? Thanks Catherine! Congrats on heading to medical school! That's amazing and very inspirational! tell you daughters to get those vids in! Thanks! It's always so nice to see people 'giving back' to the community and helping our young folks, especially during these financially difficult times. Every little bit helps! Oh, and luv me some QB!!!! I never really comment but I had to come in and say thank you Curlynikki for being so compassionate, friendly, and well-rounded girly. :-) Just the other day, as I was reading your post on date night, I said to myself how relatable and free you are with yourself. i love it. You truly are an inspiration. I'm a silent reader, but I've come out the corner to say, Nikki, this scholarship is a great idea. I love that you're supporting the education of our young sisters. Ohh wait! It has mango butter and I'm allergic to mango. Don't pick me! Thanks so much Good Luck everyone Miosha M.
quick question but when you blowdry do you ever experience dryness on your ends and do you comb or brush out your hair to form the bun and is it difficult to do so. I did a rollerset and it was nice and smooth until i had to brush it out for my bun. I may need more moisturizer I guess. All my major is criminal justice, but I think that is great that you are giving out scholarships for textbooks. Textbook are ridiculous I be like ugh! every semester. I need to make a FB quick lol! I am missing out on a lot. Good luck, everyone! Fatty B. What a wonderful opportunity!! Good luck to all! Nikki, this is such a great way to give back to the community. As a fellow "curly helper", i also try to empower my students daily to love and believe in themselves, especially the little ladies who don't feel good about their hair. Best of luck to all the college students. I remember those ridiculous textbook prices all too well. Good luck to everybody!! Thank you Curlynikki and Qhemet for providing this!! good luck to everybody, i am a junior majoring in biology and a little timid so I probably won't be entering. But thank you to Curlynikki and Qhemet for providing this scholarship. Thank you sooooo much Miss Nikki. I am so proud that there are scholarships for naturals. I feel there is so much discrimination toward naturals as it is and as a senior in high school this would be very helpful in college thank you sooo much!!!! I love the giving back! I really admire you for mentoring and giving back, while maintaining all you do and looking fab while doing it! I'll be sharing this contest with the undergraduate girls I mentor, good luck to all who enter! Christina A. That's wonderful Katherine! Thanks for your comment! Thanks for the scholarship opportunity! Thank you for this opportunity to apply for this scholarship. Please enter me in the giveaway. Chantelle F.
Good luck to all the young women entering the contest! I love the blog Nikki and my hair loves the Qhemet hydrate and twist butter. Miayaiko W.
I am a 5 year doctoral student and quite frankly you are my role model. Not only are you an inspiration to naturals but you are also an aspiration to aspiring counselors/therapists. I love it! tianna j. Enter me please! This is an awesome opportunity. Unfortunately I cannot apply for the scholarship (working on an MBA in Marketing Communications) however please enter me in the giveaway. I'm in under grad school to purse my masters in physical therapy, but psychology is my minor (its actually a very BIG part in physical therapy) can I still enter?????? I need that butter. Please let me win this giveaway!!! This giveaway and scholarship opportunity rocks! Thank you Nikki, for all you've done to the hair community and beyond! Charmony W.....I wish I would have found this site two years ago. Now I'm finally getting into the swing of this natural hair care...but better late than never! I'll be a freshman in the fall, which means that I won't have a GPA unless i use my cummulative from the last semester of high school.....will I still be eligible to enter??? I love the scholarship program. It is my dream to one day be able to help others (besides my son and daughter) attain a college education. What a great way to be a blessing!!! I love how you've opened another scholarship to other majors because although I am in high school, I have interest in the nursing/medical field so I will definitely be entering in a couple of years! I'd like to be entered the giveaway as well. - Stephanie D.
Yes, most people generally get their psych degree first at a community college and then transfer on to a major school to do their major work. Can I still apply even though I am a high school gradaute starting school in the Fall? This is a GREAT idea!! I'm so happy you thought and took the initiative to start something like this. I am also a therapist, and I can't begin to explain how of a financial toll textbooks, the DSM-IV, flashcards, etc took on me, especially in grad school. I know the young ladies that are considering going into the field of mental health will be inspired and appreciative by what you are doing for them. We are blessed to be a blessing. Keep up the excellent work. This is a great opportunity for those that want to further their education. Good luck to those entering! . I would like to enter the giveaway. Jacinta W.
Sha-Keeba H. Good luck to those entering for the scholarship. Am I eligible to apply if I'm enrolled in a part-time MSW program? I LOVE LOVE LOVE things like this! Its always great to see people creating and supporting opportunities for others, especially those who know and understand the struggles of being a student with limited funding. When I recover from grad school I hope to be able to do the same thing one day! Ericca A. enter me into the contest please! I haven't tried Qhemet products yet but I would love to. This is nice! Matini T.
I love the the scholarship idea. As a social worker on a adolescent inpatient eating disorder unit, I love hearing about others interested in working in MH. Shaquaila J.
Nikki, I would like to commend you for sponsoring this wonderful giveaway for a deserving scholar. I love that you practice the "Pay It Forward" concept, by always giving back to the Curly Nikki community. I wish this scholarship was available when I was a psych major in undergrad. Oh, well...I guess I can hope to when the twist butter. I have never tried the Qhemet product and I would me very happy if I won. I would love to rock that shirt, it says so much about women & our hair & I've always wanted to try Qhemets twist butter. Shantrell H. thanks for the scholoarship giveaway!! Good luck to all those applying for the scholarship. This is absolutley great. Nikki, you and your blog are amazing. I am in love with the shirt! Love the words, embrace your hair, embrace your heritage. I love Qhemet Biologics! Charlotte L.
Im on Facebook as Curly C.
I never had the money to buy Qhemet Biologics, broke college student. but I would love to try it!! Good luck Curlies! Great job Nik and QB for reaching back and helping those who are up and coming. I love it! Kanessa F. Good luck to the scholarship contestants! You continue to inspire me each day!! Shana B. ~ Good luck to the scholarship contestants! Good luck to all the contestants! Devin H.
This is a amazing!! I just graduated from undergrad in May so I'm missing out but I'm happy this is here because it really is tough out here for us students Tea W.
Great way to give back. Great work as always. Thanks as always Nikki, love the t-shirt!! Good Luck to all those applying for the scholarship!! I love this shirt and the opportunity for this scholarship. Maranda L.
I love the idea that you and Qhemet are giving back. Good luck to all. oh, i've never tried these products. i'd love to try them out! Good luck to all scholatships entrants. My name is Nekema H. I am a fan of you (have always been ♡ ) and Qhemet. Thank you. I absolutely love your site. It definitely helps a newbie like myself. Keep up the great work. Tiffany W.
I first want to thank you for giving us this opportunity, especially for Psych majors, because quite frankly we are very overlooked. I just submitted my email and video and of course I'm nervous. I love everything you do and your site is phenomenal! Even though I don't have a Facebook account I'm still hoping and praying for the best! Thanks in advance and enter me into ANY/ALL giveaway possible! Love the detangling Ghee! Patrice F.
Such a great contest! I'm done with school (Thank God) but I'd love a t-shirt and a new product! Thank you for this wonderful opportunity. It's so hard for students who are on a budget and finances aren't so great at home. This is a blessing. Awesome! It takes a village! Nikki, that is a wonderful job you are doing for students in these economic times. I cannot enter for scholarshops, etc., but please enter me in the giveaway. If you're a college student, undergrad or grad, check it out. This journey of maintaining this hair is a job, but worth it. Been trying to find this twist butter everywhere. Pick me! I'm excited about a chance to try the twist butter. Godspeed to those applying for scholarships! This is an awesome Scholarship opportunity! Thanks! for assistance. Textbooks aren't getting any cheaper. Aisha W.
What an awesome scholarship opportunity and giveaway! That is a great opportunity. Tifara J. ....wishes this was around when I was in undergrad, they get all the love. Pssst to grad school. But this other giveaway tho? Katia R.
I have a son leaving for college in 3 weeks and a daughter who will leave for college next August! I think its outstanding that you provide a book scholarship! Thank you! I've been following you for about 2 months and have learned A LOT about natural hair but more about MY hair!! I hope one day I would be able to inspire ppl to love themselves body and soul like Nikki, and as I raise my daughter I hope I can be to her what u are to me. Thank you. I would have loved this scholarship especially since it is for psychology. I am majoring in psychology and neuroscience but my last year was a total bust. I feel horrible about it. I would want the money to go to a nice hardworking young woman because college expenses add upand often cause people to drop out. Good luck to all the young women that enter for the scholarship.Thank you qhemet and curly nikki for recognizing academics. Expecting to receive some great info from both sites. Kudos for offering such a generous gift for students. Many first time college students (and parents) have no idea how much textbooks cost and are not financially prepared. I on the other hand would love the tee shirt and Qhemet giveaway. Thanks. Angela B.
Blessings on your natural hair journey everyone. Tiffany O.
I am super excited for this opportunity! Taylor I. Good luck to all the scholarships applicants. CN, thank you for giving these young people this opportunity. Getting edumacted (jk) is spendy these days. Also, thank you for just doing what you do. This community has really helped me succeed on my quest to healthy hair. All thr comments, YT links, and product recommendations are excellent! Also, please count me in for the random drawing; I love trying new products. Good luck everyone! Enter me in the giveaway. Tamala W.
Crossing fingers - gwen j.
Stephanie D. I really want to try this product! This scholarship is a great opportunity! The Qhemet giveaway is a plus :) -Chiemela U.
I wish this scholarship was around when I was in school,,, Good luck everyone! And give me the freebies please!!!!! Maybe after this first year of college. Thank you for the giveaway & good luck to all! Please enter me: Angela B.
I wish I could apply, but I'm not eligible because I'm not at a 4 year school yet. It's not like CC students pay less for books. I'm spending an additional $2500 (on top of the nearly $3000 I'm paying for classes) to pay for extra credits, books, school supplies, etc. This is amazing, and wish everyone good luck!!! Now the Qhemet giveaway is the bomb.com!! lol Deborah (Burton) E.
Good luck Everyone! Nikki this is great! !